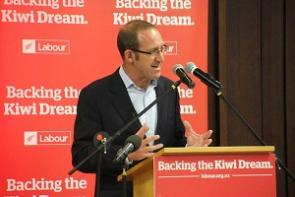 Families with young children and pensioners struggling with high winter energy bills would be the main beneficiaries of three election policies announced by Labour leader Andrew Little. The flagship policy is what Labour is calling its Best Start scheme which would pay families $60 a week for every child under three. It would not be means tested for a child's first year, but would be means tested for years two and three. "Nearly 60,000 families a year will be eligible for a $60 a week payment per baby," Little said when launching the scheme. "Families on low and middle incomes will be able to continue to receive the Best Start payment until their child turns three. "This will help our families give their children the best start in life." Pensioners and beneficiaries are also in line for some election year goodies, with Labour saying it would introduce a Winter Energy Payment of up $700 a year for superannuitants and beneficiaries. This would be $700 a year for childless couples and parents with children living at home, or $450 a year for single people, with the payments made in five monthly instalments from May to September. "I have met retirees and solo mums who have told me that they can't afford the power bills they face in winter, so they're forced to turn the heaters off," Little said. "That makes them cold, it makes them sick. "It's time for a fresh approach to fix this." Little also made it clear that the new initiatives would come at the expense of future tax cuts. "Labour's priority is investing in the services Kiwis need and boosting the incomes of low and middle income families," he said. "National's priority after nine years is an election tax bribe aimed at those at the top." "At a time when we have crises in mental health and housing, now is not the time for tax cuts," he said. I found Labour keeps saying 'Help those in real need'. Their needs seem to be just more $ from Labour's perspective. But, 'those in real need' may be more likely to better off by receiving help from themselves through, perhaps, a better life choice? Voting means less and less to NZers, and starts diminish to a mere reminder of NZ being 'a democratic country'. The proposal to take money away from low earners and then give it back to them fails on points 2 and 3 above. Why not simply take less from lower income earners in tax in the first place ? This money - go - round costs a fortune to administer by the IRD and then there are claw-backs if one spouse or partner gets a temp job. Yeah, this is terribly disappointing from Labour. More subsidies to more people. They'd be better off addressing the poor state of rental accommodation, for example. WoF or mandatory insulation, rather than just giving out more taxpayer money to more people. And heck, yet another to get younger taxpayers to pay more money to pensioners? As if young Kiwis aren't being shafted enough. In agreement with you. Even if I am not in the younger taxpayer category. Fully in favour of anything like a universal child benefit - pay it to each parent but only if residing with the child. Isn't it obvious that our best investment is our children? And isn't it well known now that the early years are the most critical. Make it more than $60 and for five years and I'm happy to lose the tax cut. Don't bother with the means test - if the family is wealthy then some will come back as income tax and every parent I've ever met will spend it on their kids so that comes back as GST. Where is the rationality behind a cold weather bonus - should they pay more the farther south you live or more if farther inland? What happens if we have an unexpected warm month? Being cold is no fun but adults just put on more clothes - if it worked when I was young in the north of Scotland then it will still work. And wool is best. The increased child benefit will keep pay the heating bills for a family. Yes but you can't really target tax cuts, everyone gets them. For example, to give poor families an extra $100 a week in tax cuts would require giving everyone $100 a week in tax cuts which is not affordable. No good tax system is ever fair. The only way it would be 'fair' is if everything was user pays. That would not be a very nice society. The only way you can give low income people more money through the tax system without decreasing government revenue is to lower the lowest tax rate while increasing the middle and top tax rates. But that still doesn't help target families who are in the most need. I'm with you on this one, for every dollar taken from someone to be redistributed to those in need how much is gobbled up by administration. NZ Labour : come back to us in 2020 with a fully rejuvenated team of young go-getters , with fresh ideas , with some vision for New Zealand ! no vision no leadership.... sounds to me like National. I don't think the country can handle another four years of rampant neoliberalism, wage suppression, extremely high third world immigration. What is "growing the economy" and how do we do it? I hear this all the time, Councils need to do it, politicians need to do it, everyone needs to do it. But I have never seen/heard anyone suggest an actual workable methodology on doing it for any meaningful length of time. So is this new idea if it sees the light of day going to replace Working For Families ? My rental property at 5 Prebble Place, Mission Bay is warm and dry and wouldn't need such subsidies! And when I say my property, I mean someone else's, "the landlord's", to clarify. Giving people money to pay their power bill reduces the incentive to save power and will ultimately result in higher electricity demand and therefore increased running of coal and gas fired plants. How's that for a green policy from Labour ... let's subsidize gas and coal fired generation!! Brilliant. When you know nothing about markets you end up with policies like this. I have to agree with all of the comments. They could just take less tax rather than administering a new scheme that involves more jumping through hoops for people. The least educated will be disadvantaged. Of course your argument that people will use more power rather than conserve where it doesn't harm their health is accurate. This policy is uninspired and unsophisticated. Do the surveys they've made signal that this will buy them votes? Also, the extra payment isn't actually targeted at energy spending as far as I can tell, so there's no reason to think people will spend it on extra heating more than on extra food. Not a particular fan of the policy at first glance, but not sure if your particular issue is valid. So instead of a power subsidy it is more booze money? Yes, just like National's proposed tax cuts. What would I spend the National tax cuts on? Possibly luxuries such as booze where they'd collect most of the money back as tax, or investment. Not sure I need that much money for spending on alcohol. So whats the difference between this handout and Working For Families ? Why is there now another program which seems to target the same category of family as WFF ? So is this Best Start program proposed by Labour going to replace Working For Families ? Or are we going to add another layer of complexity to an already over-complicated tax system . Labour has its heart in the right place. Just wish they would stop these fancy schemes - just increases employment in Wellington. But you'll be able to buy more Speights under Labour with your heating money, as Andrew does not compel you to actually spend it on electricity. If you do spend it on heating my power co shares will go up, so if we have another loopy lefty coalition I'll buy some more....especially if the next policy is to subsidise electric vehicles for others apart from themselves. the heart is never a source of good policy. Labour has its heart in the right place alright, and its hands in the pockets of every serious earner and TAXpayer in this country - that is what they are good at (Robin Hood style crap) - they cannot let go of this stupid outdated principle of taking from the rich and give to the poor easy peasy so the poor get even lazier - why work when you get such a awesome pay rise ... just pop one every 9 months to get more money from WINZ ... perfect !! they just cannot be trusted, the more policies they reveal the deeper they sink in the polls! and this one reveals the ugly face of this hippocratic lot ... I guess this benefit cannot be called "sugar fix" in Grant Robertson vocabulary eh? Really ? How can labour think such idea will do anything other than drive their vote down. Yeah you have to wonder don't you? The old centre left Labour (e.g. Phil Goff) would have a decent chance in this election, but Little has no chance. ... if some other of the young guns was up there with Jacinda Ardern ; Kelvin Davis or Stuart Nash ... I'd say " Game On " ... sadly ... its 3 more years , guys ! You wonder how many of them wish they had showed a bit of patience before staging their respective coups. ... ah yes, they're an " extreme Nanny state " .. Unlike Labour , NZ First doesn't have a light-bulbs and shower heads policy for us all ... a-ha ! Meanwhile, National is the 'Granny State', focusing policies on concentrating as much as wealth as possible into the hands of its older voters at the expense of preceding and succeeding generations of Kiwis. Kiwis are stuck between a rock and a wet fish when looking for a decent party to vote for, now that Labour has come out suggesting the best thing to do is give more of young Kiwis' money to old folks over the winter. Rick: a little sensitive to your remarks about old and young. The main problem I have is that you are right. I don't feel desperately guilty and balance the sheer good luck that I happened by accident to end up buying Auckland property a decade ago with the numerous occasions I've had bad luck (one being deciding to save for my retirement and investing in Equitable life who had been the best pension provider in the UK for over 220 years). Auckland has its fair share of poor elderly folk such as my neighbour who is a retired drainlayer living in a state house who has drunk any savings he ever had. Then there are the fellow POMs who arrived the same year as me and put all their money into what became a leaky home that eventually they demolished. My conclusion you really need to have some savings and then life is mainly a matter of luck. However speaking on behalf of the lucky old ones if the option was open I'd prefer to be young and totally impoverished to old and moderately wealthy. Why oh why doesn't Labour play to their strength and say "we are for typical NZ workers first and foremost, then for those unable to work and finally and way last the top 2% except to keep business creators in NZ." Appreciate the insight, Bob. Thanks. I never hold anything against those who appreciate what they were lucky to receive, and don't begrudge it for following generations...and it's that much the more to respect when they've had a heavy dose of bad luck with it, to boot. I do think we'll be better in future if our poor elderly are in houses they own outright than relying on the taxpayer to help them with rent and pension, or struggling in tremendous poverty, and that I think is one of our biggest issues with allowing the wholesale selfishness of some that drives politicians to maintain the advantaging of incumbent property investors uber all. Agree re Labour...and I actually reckon they may end up doing that, though they're not there yet. As home ownership plunges and most of the tax burden is foisted on workers while those with land get a comparatively free ride, there's a ready space there for them to operate in. How to solve the 3 main young -v- old gripes. 1. Pension should not start at any specific age; it should be for the last 15 years of your life and an actuary would put that close to 70 now and likely to increase to 75 as life expectancy increases. Note easy to finance. Since we do age before we retire there does need to agencies to assist - moving manual labourers into other work when they are about 50; computer programmers to something easier about 60; etc. 2. House prices - actually there is no problem with house prices it is the land. My $1m house would be about $250,000 in a decent suburb of Dunedin. Just nationalise all land. This would also stop foreigners buying up NZ. 3. University fees and loans - the problem came with too many going to uni. When I went it was 4% and now it is about 50% so the cost of supporting students went up more than 10 fold. A partial solution is to cut back on numbers - why spend 3 or 4 years at university to then become a secretary? Even my own trade of programming - all the best programmers never went to uni just like most of the best writers never went to creative writing courses. Agree re the last point - but it'll need companies to come to the party and train people out of school like they used to, so young folk don't have to go to university for their CV even to get a look-in. At least Labour had 9 years in power before coming up with those (and even then I think they came from the greens). How about a party promising to build roading so that the Manawatu Gorge,Waioweka gorge and the Kapati coast roads are kept open. Global warming should sort that out. There won't be as many landslides when the place is 10 degrees warmer. Everyone's in a lather about " Global Warming " ... but where is it ... if you gave us an extra 10 'c it'd now be 15 'c in Chirstchurch city ... brrrr .... bring it on ! Might actually be colder - you might be under water. Labour has given up hope of governing so is desperately shoring up its support among the shrinking group of voters who still live in a fairy land where money just magically arrives in the government coffers to be dished out. Where tax and benefit regimes that penalise hard work and enterprise are a good thing. Where the 20% paying 65% of all income tax, should pay more. That's it? Tinkering around the taxation edges isn't going to solve inequality or poverty. Nor is rolling back to 2010's taxation settings. Why not broaden the tax base? Where's a wealth tax? Land tax? Capital gains? Even just a 40% tax rate on 100k earners (rich pricks)? Actually 100k aren't rich pricks - if you have two children, you get $1 per week under Labour's proposed WFF package. True, $100k is barely an eighth of the price of an Auckland house. If you have one 100k income and an at home mother you are a lot worse off than two people working at $50k as you pay the rich pricks tax. You also get no maternity leave payout, no WFF, no free child care, and none of labours new subsidies that all that tax is paying for. Single income families are massively ripped off in this country. You are far from rich if you earn $100k and have a $600k mortgage. Making them slightly less rich does not expand your tax take, at all. I really don't like this from Labour. I wish I did. I don't like National. I'd much rather see them deliver meaningful responses in terms of housing, health and education. I know it's a cliche, but there's also some truth - what's to stop a certain number of recipients of these handouts just spending it on fags and booze? If they provided a comprehensive housing solution, then people would pay less on housing, and they would have more $$$ in their back pocket. To me, this just reeks of cynical vote buying (capture young 'parents to be', and the aged - so a good chunk of the population between 20 and 40, and also 65 plus). An capitalises on the seasons (ie. come election time a cold winter will still be on people's minds). This feels pretty un-creative and 'tired' to me. I'll need to look elsewhere for my vote, I think - Greens or maybe Winston. Labour needs to turn their housing package into a positive hopeful vision for the future of NZ. What is needed is a good vision that moves NZ away from the status quo. This policy will take Labour even lower in the polls. With Andrew Little barely making it above the margin of error for preferred PM perhaps there's an opportunity for Winston to be the PM of an NZF, Labour and Green coalition. NZF and Labour holding ministerial positions and Greens in their usual bridesmaid role. I have been a staunch Labour voter my whole life. I remember going to local halls on election night with the old man when Bill Rowling was the heir apparent. I just can't bring myself to vote for them. Little is a wall flower. To be fair English is no better, I've heard him described as a loaf of bread with a face painted on it. He is uninspiring at best. Its going to be a coin toss for me. The reality is no matter who ends up in the house, the status quo will largely remain. May as well vote for Winnie or the Greens. Be brave, read TOP policies. I hope they do get over 5%. Just vote for NZ First - common sense policies! Check them out. Vote for National. Go with the majority 47% of the population. Don't just look at the leaders, as there's nothing to get excited about there. Have a look at who else is on the lists. View some episodes of Backbenches, also quite illuminating. That has helped narrow it down for me, and also provided some optimism (over-used phrase warning, ahead) going forward. There's more to it than the dull-fest battle of Andrew vs Bill. Even if these policies were great (and that's doubtful) they are unexciting. Nothing to win an election. Something stupid like offering free hot drinks at the local council office on cold days would at least get headlines and stick in the voters heads - given a cold election day it might win it for them. I cant believe the negativity around this policy. Sure it wont benefit me but jezz. Are you really all so selfish that you want to see poor pensioners eating cat food and dying of cold in the winter? The specifics are a little vague but it looks like the pension top up is going to be a targeted policy with people applying through WINZ. That probably means the'll need a community services card to qualify. Giving money to people at the bottom itsn't a bad idea because they actually spend it stimulating the local economy. Taking from the poor and giving to the rich like a inverse Robbin Hood is Nationals policy and we've seen where that's got us. Regarding insulation, Everyone knows our houses are cold uninsulated boxes. Rentvester / Landlord / tenant arrangements mean that nobody is going to upgrade the houses because there's no financial benefit for them. Dangling a $2000 carrot might provide just the oomph to get people to invest. Its all good vision from Labour IMHO. I don't mind helping lower income earners but it's the wrong way to go about it. Instead of giving my tax money to landlords, just force them to make their product healthy and safe like any other business. The main cost to almost everyone is housing, bring that down through any means. Food is overpriced too, start a competing supermarket chain. Build another power station and flood the market with cheap power. Just stop sending my tax money to the uber rich via the poor. "Just stop sending my tax money to the uber rich via the poor." It all ends up with the uber rich eventually. Does it really matter how? fat pat. Over 40% of Kiwis pay zero income tax net of WFF payments. 20% of earners pay 65% of all income tax. NZ has a highly redistributive income system. Pensioners fare very well on international deprivation indexes. Money is not, as you assert, being 'taken' from the poor. Clearly it's the other way round. Personal marginal taxation rates are already at levels that discourage enterprise. Little blithely ignores the fiscal drag effect on tax rates that is unfairly penalising so much of middle NZ and will pay the price for this middle finger gesture to Waitakere man, at the polls. I live in Germany where average income taxes are over 40%, and you have to pay $600 euros per month health insurance if you're self employed, so I beg to differ with you on the highly redistributive NZ income system. I wouldn't begrudge people on WFF either. They probably don't own assets and are likely in a pretty miserable situation. Look the super payment is max $390 per week for a single person. My late grandmother struggled to maintain her house with that level of support. Imagine the upcoming young Kiwis, who probably won't have a freehold house to live in either...National's brighter future unfortunately doesn't seem to include those younger Kiwis. The problem with WFF that Clark/Cullen introduced in 2005 is that low to middle income families have not benefited from it. Increasing housing costs -rent or increased house prices means most of the benefit has gone to people who owned property prior to this date -they benefited in the form of huge untaxed capital gains. Auckland house prices have doubled since 2008 (not sure how much since 2004) - but that is definitely the biggest redistributive benefit from one group to another in NZ's recent history. Nailed it; sacred cows like WFF, and maybe Kiwisaver are benefiting the wrong people.And distorting markets more than somewhat. The winter fuel payment of $700 per couple would not be means tested,so we would get it-and we certainly don't need it. I could write out a long list of people I know in a similar position.I could go out and blow it on a case of decent Pinot Noir and that doesn't strike me as a good use of public money. I remember when the UK did it. I listened to Little being interviewed re polling numbers this morning and frankly,his answers were dismal. This is a shame,as I would be quite happy to see a change of government. This one has had quite long enough. Cool, that's 35 bottles of Akarua "Rua", which I am sipping(bloody good) as I type:go Andrew Little!! It specifically says in the attached fact sheet that the winder fuel payment will be delivered through WINZ. If you read between the lines that probably means it will require a community services card, (hence means testing). I'm just trying to interpret the actual data. Yep they will get my vote for the first time. The Greens have some good policies but they lost me when James Shaw said in his speech to the Federation of Multicultural Councils last week "Because the background terms of the debate are now so dominated by anti-immigrant rhetoric, when I dived into numbers and data, a lot of people interpreted that as pandering to the rhetoric, rather than trying to elevate the debate and pull it in a different direction." Numbers and data are essential to keep the emotion out of an important issue. Rhetoric just means persuasive so all he needs is to collect facts to counter it. So I interpret the Greens policy as (a) being willing to flip/flop on important issues and (b) they think that an elevated debate is one that flies above the evidence. However the dreaded words "Yearly Immigration Quotas' is still on their websites immigration policy detail. Of course no party has to have an agreed policy on every issue. They have 28 other policies. The feeling will pass, evaporate into thin air, then National wins. That's what will happen. Good policy, will win votes at from its target audience. Pensioners and young families with sick children. All for the similar low price of a flag referendum. areyouserious. Yep.The 'target audience' being the 27% who already support Labour. Meanwhile middle NZ whose tax rates have crept into the marginal bracket over recent years and who were looking forward to this inequity being addressed, are saying 'not fair'. I beg to differ in this case. I think Little has done the right thing by taking $2.5 billion out of the pockets of hardworking Kiwi families from 1 April next year to feed the poor. He cares - give him a chance, people! yeah, he just cares a bit too much using other people's money - he is trying though, have to give him that !! It's band aid stuff. And cynical. JUST HOLD ON A MINUTE .......... Dont we already have Working For Families as a program to assist the lowest paid workers put food on the table ? And was Working For Families not a Labour initiated program ? So in addition to Working For Families we are going to have BEST START ? Or Mr Little is Best Start going to replace WFF ? And that's before you get to Nick Smith, Minister for Confusion. Why not provide big solar water heating subsidies. That would mean the money is going directly toward heating needs and provides better bang for buck, providing for an investment rather than a perpetual income top up. I find this lacking too. Living in Auckland and owning a modest house plus being a low income earner, I qualified for a $600 rebate on my rates/water from Auckland Council. Soon to be a pensioner, I will also receive pension plus $450 pa for - something. So here is the odd question - why would a couple with no children get $700 if they need it for heating against a single person? Just figuring that if you heat the house (or a room), that would keep two people warm, the same as one. So what is it for? Is there an assumption that we are all shivering, which is not true and no my house is not insulated to the level they are wanting. Darn - those red wines sound good for a non drinker. Supposed to be good for your health apparently. If Labour is going to spend this extra money, instead of handing money out on a recurrent basis, why not use the money to invest in improved early childcare and education and in improving home insulation to increase energy efficiency? Are they trying to lose with these sorts of policies? All this will do is make people more reliant on larger handouts, rather than fixing the underlying problem. I recall when Labour were last in, a lot of the reason they got voted out was because people could see that they were making everyone a beneficiary of some type, but the country was becoming more and more nanny state. By making more people beneficiaries this increases their voter base. Labour have no interest in helping people become successful and independent as success and independence means people become less reliant on the state handouts and less likely to vote Labour. Has any of the parties simply considered a tax rebate system ? if at the end of the tax year you earn below a certain level you fill out your PTS and get a rebate. This works because you simply cannot change the tax "brackets" system as it stands without everyone getting the benefit. This type of system is already in place for your rates, earn below $24K PA and you get $610 off your rates bill. This would be pretty simple to implement by the IRD would it not ? Those on a minimum wage get say $2000 back each year, if they worked all year. I would have thought it was a no brainer if you wanted to get the money to those who really needed it. The bottom line is it all comes down to how much you earn each year, why is it fair to keep throwing money at people who have kids ? what about those single people struggling to pay the mortgage all on their own ? why don't they get some assistance ?